A perfect treasure from another time, this stunning envelope in pure "fil de lin" ecru linen was created to store one's nightgown as well as to adorn the bed. 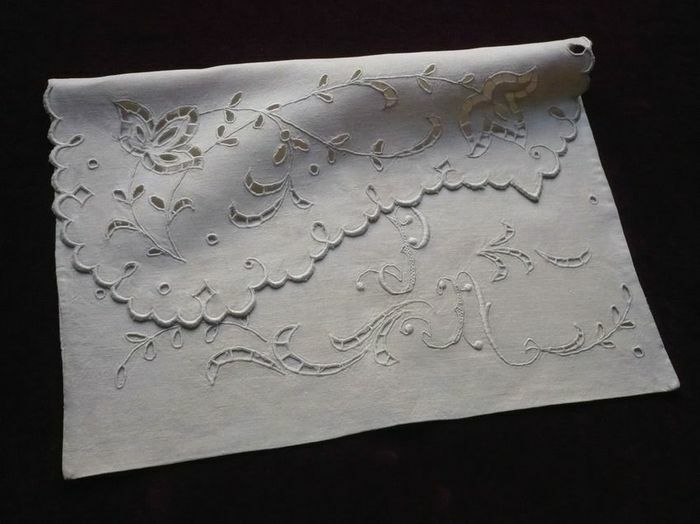 The flap, with a lovely assymetrical wave-like shape which reveals the monogram below, is decorated with a spray of anemones, materfully embroiderd in Richelieu cutwork. A beautiful monogram, "PN," is embroidered in an important relief of bourdon and post point and accented on either side with vines executed in Richelieu and English cutwork. The edges of the flap are also hand embroiderd with a pretty scalloped border. Likely dating from the early 20th century this charming envelope is in as new condition and judging from its perfect state has quite possibly never been used. Dimensions: 15.5 x 10.5in.